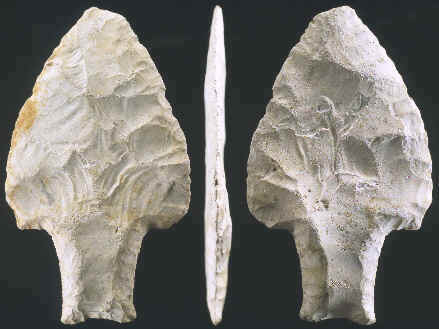 This stemmed fluted "Fishtail" point was found several years ago on the bank of the New River Lagoon in northern Belize, next to the Mayan site of Lamanai. Only one or two other Stemmed Fluted points have been recorded to date from Belize. 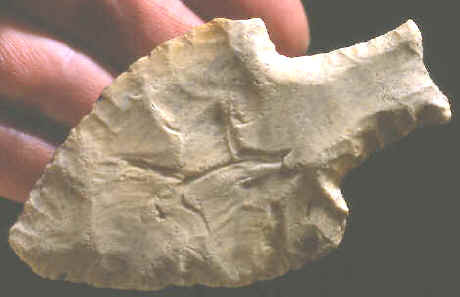 This point is a nice example of a fairly rare Paleo-Indian point form that are generally known as Fishtail projectile points. Although this example seems to be wider and thinner than points illustrated from sites like Fell's Cave or El Inga. It's possible that it was used as a knife rather than a projectile point. Many archaeologists believe these points are diagnostic indicators of early peopling of South America and countries north to Mexico. On sites like Madden Lake in Panama, Fishtail points are found with two different base styles. Some are similar to this example, they have wide shoulders and narrow stems that expand on the end. Others have a very recurved blade edge with expanding "Fishtail" bases similar to Simpson points from the southeastern United States. Stemmed Fluted points have been found as far south as the southern tip of Argentina on the Fell’s Cave site where they have been dated to 11,000 years ago. These fluted and unfluted stemmed points and fishtail points without shoulders have been found in several different countries to the north all the way to the southeastern area of the United States. Stemmed Fluted and Unfluted points are found in a wider area than almost any other Paleo point form in the Americas. This "Fishtail" point is fluted on both sides beyond the length of the stem. It was thinned with large wide percussion flakes that overlap in the center. This point is very heavily patinated with a chalky surface. It's made of a yellowish white opaque chert and measures 3 ½ inches long and 2 1/8 inches wide. 1973, William J Mayer-Oakes, SCIENTIFIC AMERICAN--EARLY MAN IN AMERICA "Early Man in the Andes", pp 53-61. 1978, Junius B. Bird & Richard Cooke, EARLY MAN IN AMERICA "The Occurrence in Panama of Two Types of Paleo-Indian Projectile Points", pp 263-272. 1991, Gustavo G. Politis, CLOVIS ORIGINS AND ADAPTATIONS "Fishtail Projectile Points in the Southern Cone of South America: An Overview" pp 287-301. 1998, Personal Communication--Georges A. Pearson, "A Fluted point From Belize and its Implication for a Circum-Caribbean Paleo-Indian Culture Area"